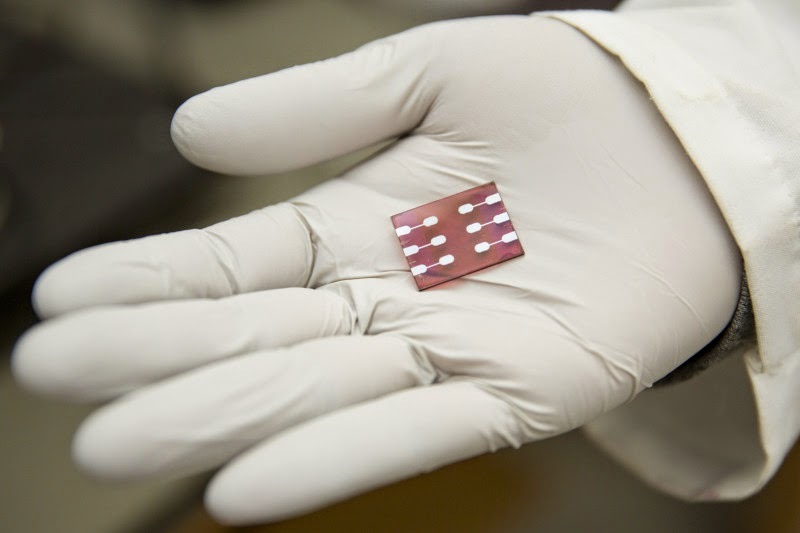 New light has been shed on solar power generation using devices made with polymers. Researchers identified a new polymer -- a type of large molecule that forms plastics and other familiar materials -- which improved the efficiency of solar cells. The group also determined the method by which the polymer improved the cells' efficiency. The polymer allowed electrical charges to move more easily throughout the cell, boosting the production of electricity -- a mechanism never before demonstrated in such devices. Researchers identified a new polymer -- a type of large molecule that forms plastics and other familiar materials -- which improved the efficiency of solar cells. The group also determined the method by which the polymer improved the cells' efficiency. The polymer allowed electrical charges to move more easily throughout the cell, boosting the production of electricity -- a mechanism never before demonstrated in such devices. "Polymer solar cells have great potential to provide low-cost, lightweight and flexible electronic devices to harvest solar energy," said Luyao Lu, graduate student in chemistry and lead author of a paper describing the result, published online last month in the journal Nature Photonics. "The field is rather immature -- it's in the infancy stage," said Luping Yu, professor in chemistry, fellow in the Institute for Molecular Engineering, who led the UChicago group carrying out the research. The active regions of such solar cells are composed of a mixture of polymers that give and receive electrons to generate electrical current when exposed to light. The new polymer developed by Yu's group, called PID2, improves the efficiency of electrical power generation by 15 percent when added to a standard polymer-fullerene mixture. "Fullerene, a small carbon molecule, is one of the standard materials used in polymer solar cells," Lu said. "Basically, in polymer solar cells we have a polymer as electron donor and fullerene as electron acceptor to allow charge separation." In their work, the UChicago-Argonne researchers added another polymer into the device, resulting in solar cells with two polymers and one fullerene. The group achieved an efficiency of 8.2 percent when an optimal amount of PID2 was added -- the highest ever for solar cells made up of two types of polymers with fullerene -- and the result implies that even higher efficiencies could be possible with further work. The group is now working to push efficiencies toward 10 percent, a benchmark necessary for polymer solar cells to be viable for commercial application. "It's like a step," Yu said. "When it's too high, it's hard to climb up, but if you put in the middle another step then you can easily walk up." Thanks to a collaboration with Argonne, Yu and his group were also able to study the changes in structure of the polymer blend when PID2 was added, and show that these changes likewise improved the ability of charges to move throughout the cell, further improving the efficiency. The addition of PID2 caused the polymer blend to form fibers, which improve the mobility of electrons throughout the material. The fibers serve as a pathway to allow electrons to travel to the electrodes on the sides of the solar cell. "It's like you're generating a street and somebody that's traveling along the street can find a way to go from this end to another," Yu said. "Without that it's hard to get insight about the structure," Yu said, calling the collaboration with Argonne "crucial" to the work. "That benefits us tremendously," he said. Chen noted that "Working together, these groups represent a confluence of the best materials and the best expertise and tools to study them to achieve progress beyond what could be achieved with independent efforts.